When his older brother leaves to fight in the Second World War, fourteen-year-old Homer Macauley takes on a job as a bicycle telegraph messenger to provide for his widowed mother, his older sister and his younger brother. Homer delivers messages of love, hope, pain and death to the good people of Ithaca, but soon must grapple with a message that will change him forever. 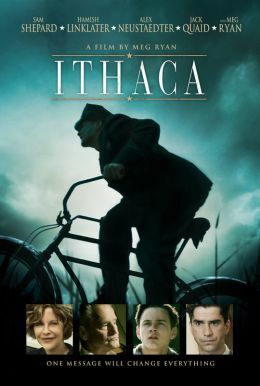 Based on Pulitzer Prize-winning author William Saroyan’s 1943 novel The Human Comedy, Ithaca is a coming-of-age story about the exuberance of youth, the abruptness of change, the sweetness of life, the sting of death, and the sheer goodness that lives in each and every one of us.